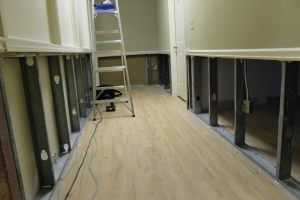 Take a look at our project photos! 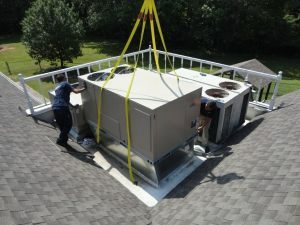 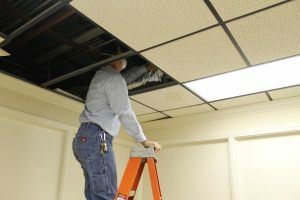 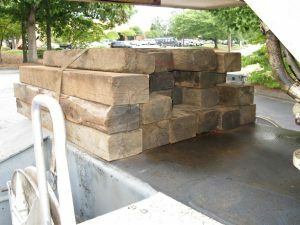 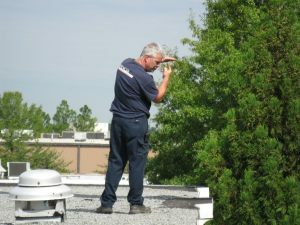 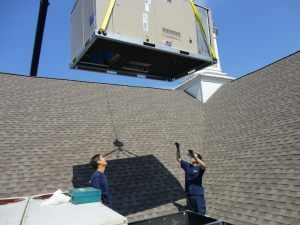 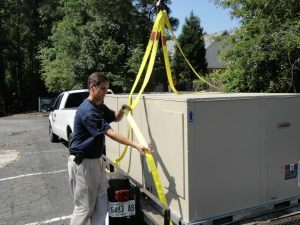 Our crew is replacing a packaged unit at a Norcross office park. 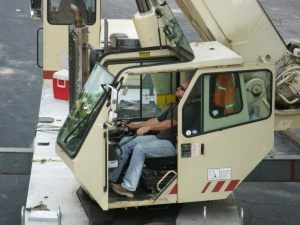 Eric helps the crane operator set up. 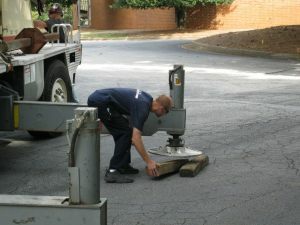 The stabilizer rods must be let out and 6x4 boards placed underneath them in order to preserve the pavement. 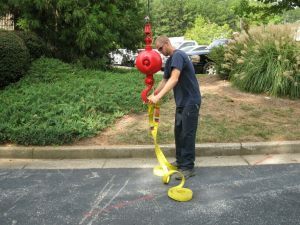 Long straps are installed on the ball and hook because they must wrap (carefully!) 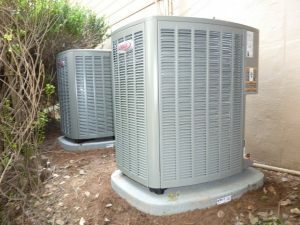 around the old and new units. 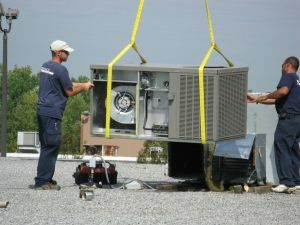 If not done properly the unit could slip out of the straps. 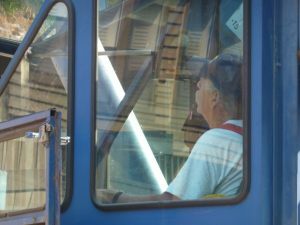 John communicates using hand signals to the crane operator to insure that the whole transition runs smoothly. 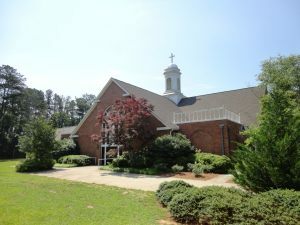 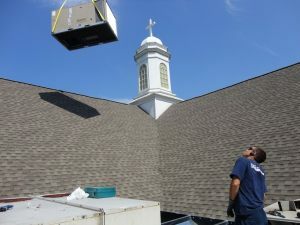 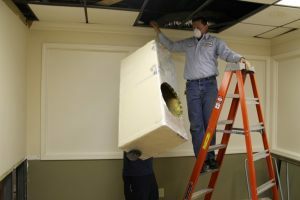 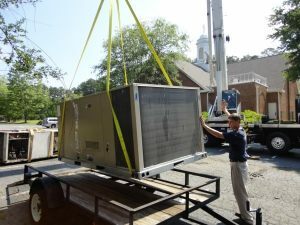 Patrick and Brian are replacing a packaged unit at a Norcross church. 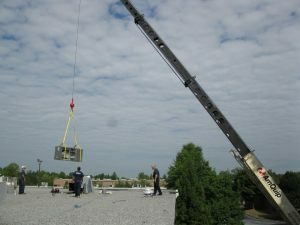 The crane must lift the unit up over the ridge of the roof to the other side. 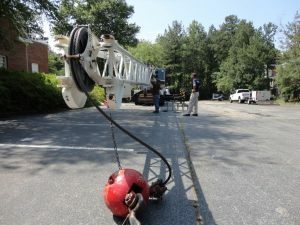 This set up required Patrick to communicate to the crane operator using a remote device from the "blind side" of the building. 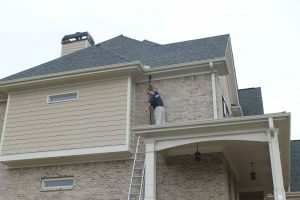 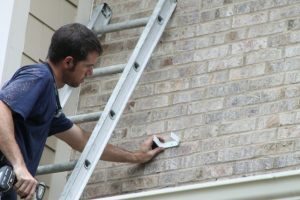 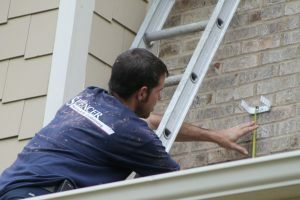 Patrick and Eric are installing refrigerant lines in a faux downspout in Buford. 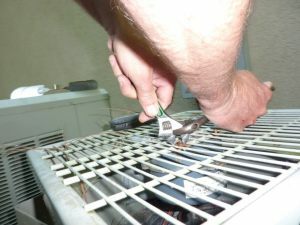 This is not a simple task! 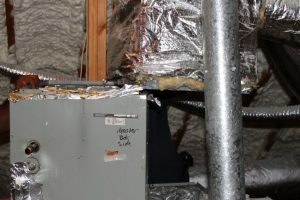 To mention a few of our challenges we had to locate the roof joists in the attic above the awning; determine the place for a hole between them by running a chalk line down the side of the house that would miss the porch, the room overhang, the kitchen vent and gas meter; drill a hole in the crown molding at an angle to allow for the gradual bend of the refrigerant lines; cut the molding PERFECTLY to accommodate the downspout; avoid crimping the lines while installing them into the downspout; clamp the whole contraption to the wall and run both ends of the refrigerant lines to where they would be soldered into the a/c system. 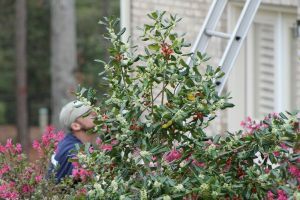 Try doing all of this on a tall ladder set in the bushes! 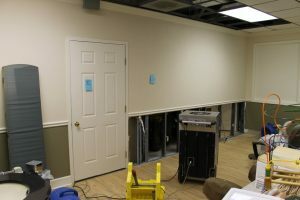 This medical office in Dunwoody was flooded by a water heater in the suite above it. 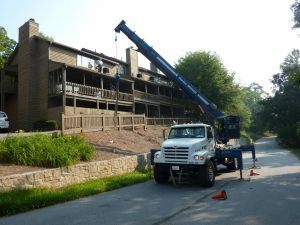 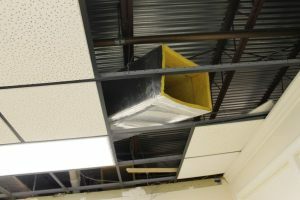 A contractor has already removed the affected sheet rock and has set in place blowers and a dehumidifier to dry out the space. 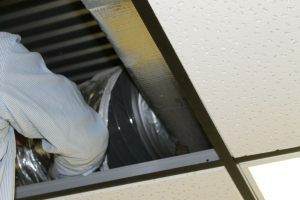 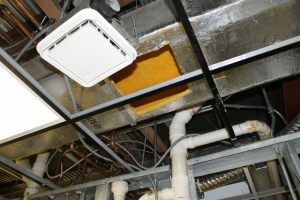 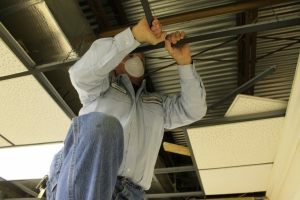 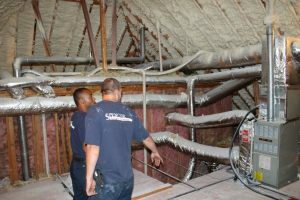 Our job was to examine the ductwork (located above the drop ceiling) and replace the affected areas. 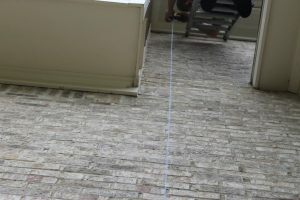 We cut out sections of the rectangular duct board trunk line and examined them for moisture. 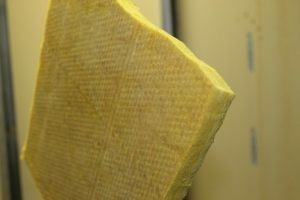 The piece you see here was moist. 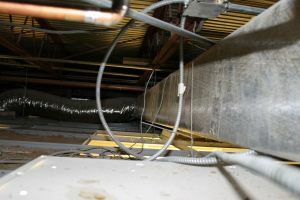 We also examined sections of the round duct for moisture both in its spiral lining and outer insulation. 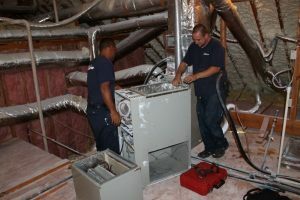 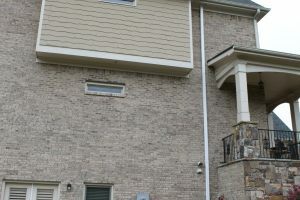 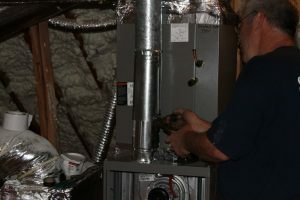 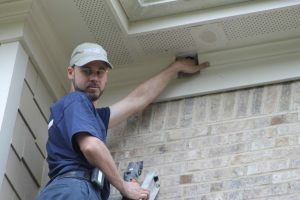 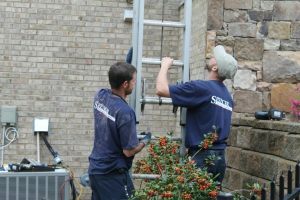 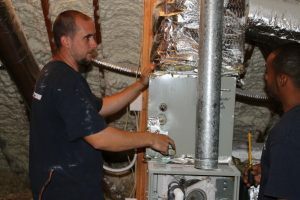 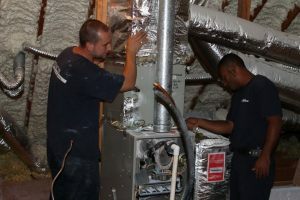 Ken and David are replacing two complete systems in an Alpharetta home. 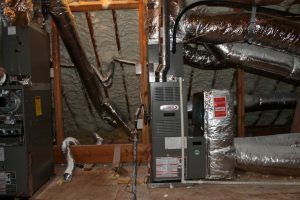 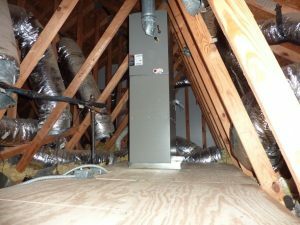 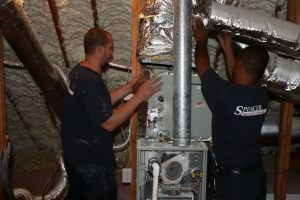 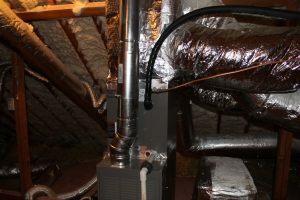 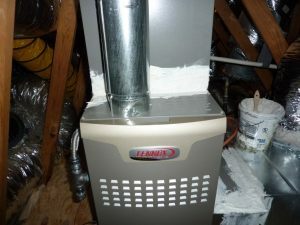 This installation included two furnaces set side by side in an attic. 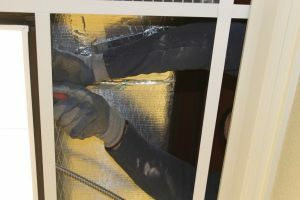 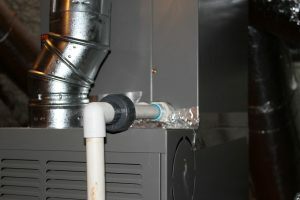 Note the details you should look for in a good installation: armor flex insulation the full length of the suction line (to avoid water dripping on the ceiling during normal use), double wall vent pipe, a pvc drain union for repeated drain access, and a secondary drain pan and float switch. 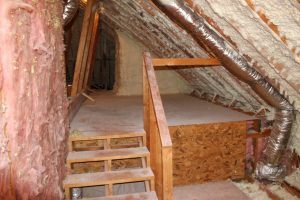 The attic roof has been sprayed with foam insulation previous to our arrival to keep the heat out. 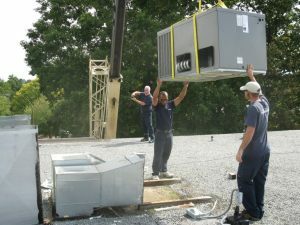 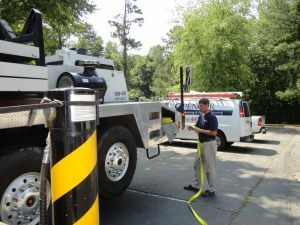 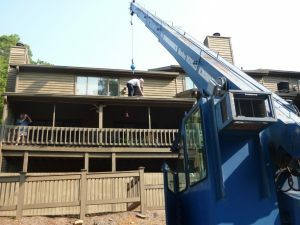 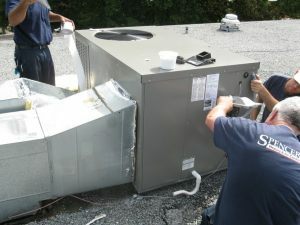 Here we are installing two residential heating and cooling systems in Dunwoody. 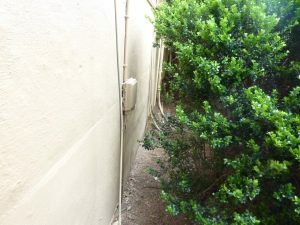 The old air conditioners were covered in bushes. 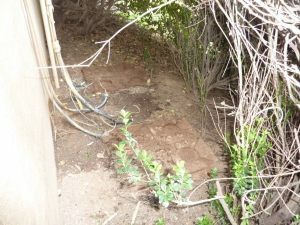 We had to carve a discreet path into the bushes in order to remove the old units and bring in the new ones. 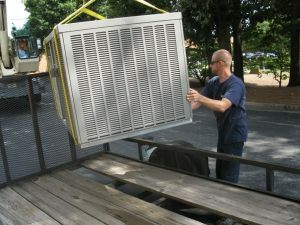 It was especially important to cut away enough brush so that the condensers could "breathe". 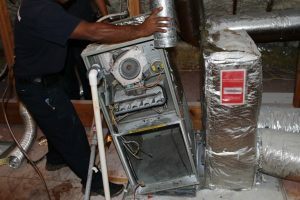 Otherwise they would continue to recycle the hot air produced from the heat transferred from inside the house to the outside. 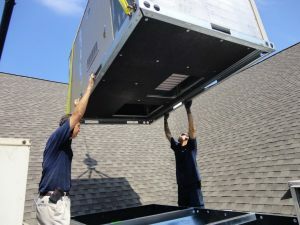 This state of affairs would reduce cooling capacity and efficiency, and could shorten the life of the units. 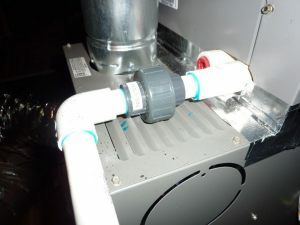 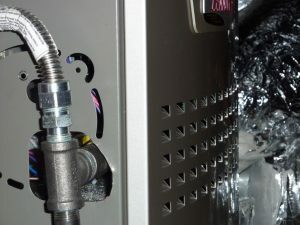 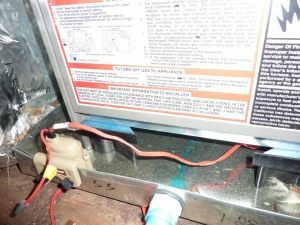 Note the level condenser pads, insulated thermostatic expansion valve, secondary drain pan under the furnace with an emergency cut-off float switch and the PVC drain union at the evaporator coil to allow repeated access to the drain line. 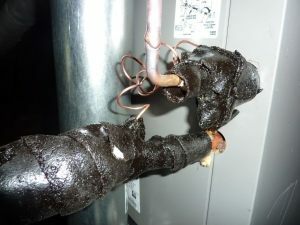 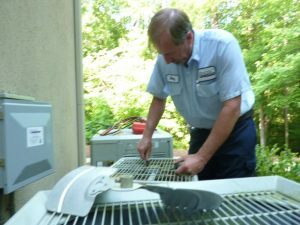 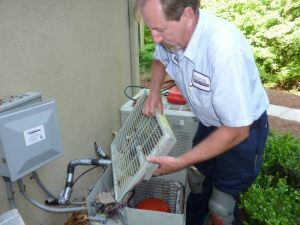 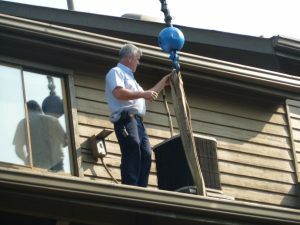 Bobby is changing a condenser fan motor on a no cool call during the summer. 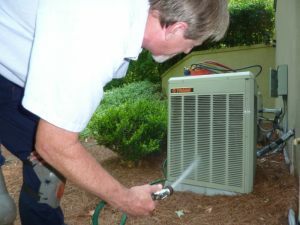 He cleans the condenser coil to insure peak performance. 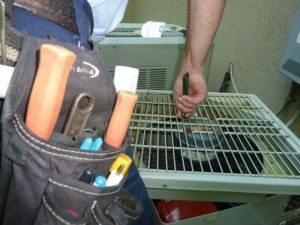 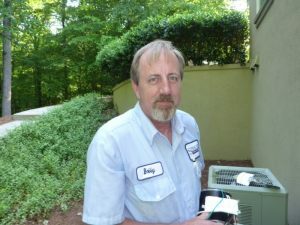 Jon replaces a condenser in Chamblee. 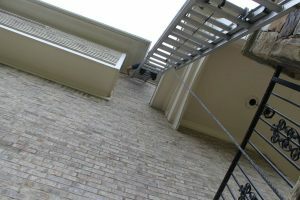 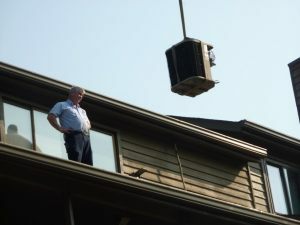 This unique set up requires the serviceman to climb through a master bedroom window to access the a/c unit! 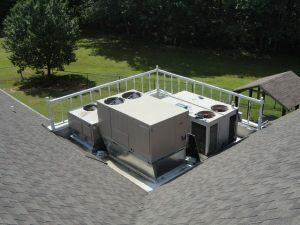 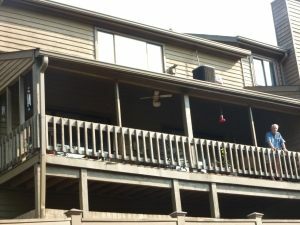 The unit sits on a roof overhang. 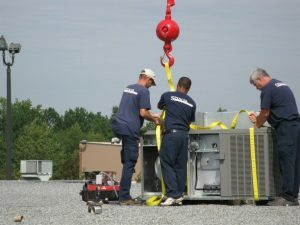 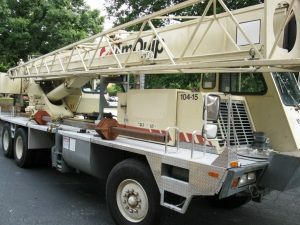 It also requires the installer to acquire the services of a crane. 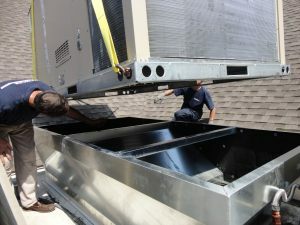 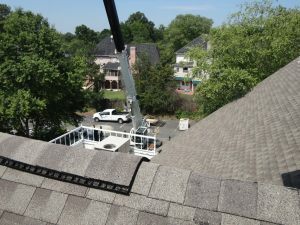 The condenser needed to be leveled to accommodate the slope of the roof and secured so that it would not fall off!